(CNN) -- Kevin Pietersen and England colleague Andrew Flintoff will come under the hammer at the Indian Premier League auction in Goa on Friday when eight franchises are expected to spend $14 million on 17 players. 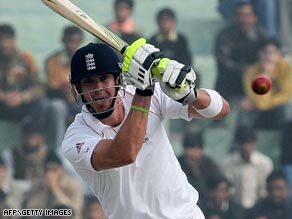 England Test star Kevin Pietersen is the top-priced player at the Indian Premier League auction. England's Test stars have been given a three-week window to appear in the tournament which takes place from April 10 to May 29 with the promise of massive financial rewards. The auction includes players from Australia (14), Bangladesh (4), England (7), New Zealand (3), South Africa (5), Sri Lanka (4) and five from West Indies. Former England captain Pietersen is the top-rated player at $1.35m with Flintoff second at $950,000 after Australian batsman Michael Clarke ($1m) pulled out to spend more time with his family -- reducing the players on offer to 42. This year cricketers set their own reserve price and commissioner Lalit Modi confirmed that players auctioned on Friday will be contracted for two years with the IPL. "Last year we did (auctioned) over a 100 players for $40 million," he said. "This year we are doing 17 players for close to $14 million. It's a lot of money," he told PA Sport. "You can't expect teams to change completely every year. It will be interesting to see the strategy the teams evolve, because this is more about out-guessing and out-buying the other teams. "Until now, the teams did not know just how much money the other teams had available for the auction because they had bought players prior to the auction." England players given an IPL contract will be paid on a pro-rata basis and will have to give pass on 10 percent of their earnings to their counties. The IPL cut the original list of 114 players available on Friday after consultation with the franchises who must do without Pakistan players, prevented from participating by their government after safety concerns. Franchises must decided whether to terminate contracts of Pakistan players and risk having to pay more to buy them back in the future, or alternatively suspend existing deals. AUSTRALIA: Aaron Bird ($45,000), Brett Geeves (45,000), Bryce McGain (50,000), Daniel Harris (50,000), Dominic Thornley (50,000), George Bailey (50,000), Jonathan Moss (50,000), Michael Dighton (85,000), Michael Hill (50,000), Phil Jacques (100,000), Shane Harwood (75,000), Shaun Tait (250,000), Steven Smith (75,000), Stuart Clark (250,000). BANGLADESH: Shakib Al Hasan ($75,000), Mohammad Ashraful (75,000), Mashrafe Mortaza (50,000), Tamim Iqbal (50,000). ENGLAND: Kevin Pietersen ($1,350,000), Andrew Flintoff (950,000), Luke Wright (150,000), Owais Shah (150,000), Paul Collingwood (250,000), Ravi Bopara (150,000), Samit Patel (100,000). NEW ZEALAND: James Franklin ($50,000), Jesse Ryder (100,000), Kyle Mills (150,000). SOUTH AFRICA: Gulam Bodi ($100,000), JP Duminy (300,000), Morne van Wyk (100,000), Tyron Henderson (100,000), Yusuf Abdullah (25,000). SRI LANKA: Thilan Thushara ($100,000), Nuwan Kulasekara (100,000), Kaushalya Weeraratne (50,000), Chamara Kapugedera (150,000). WEST INDIES: Kieron Pollard ($60,000), Fidel Edwards (150,000), Dwayne Smith (tbc), Kemar Roach (50,000), Jerome Taylor (tbc).